Coes Metaalbescherming has several contiguous halls, with a total length of nearly 500 metres and more than 10,000 m² floor area. The large spraying halls and the newest galvanising hall are LED-lit. Our galvanising hall boasts powerful extraction, with a capacity of 30,000 cubic metres per minute. Coes Metaalbescherming is able to blast and conserve almost any kind of product efficiently. We have roller systems for blasting, and separate ones for metallising, ideal for heavy round tubes and antennae. Because we continually invest in the right equipment, Coes Metaalbescherming can offer you the assurance that your items will be treated with the greatest possible efficiency. Our several overhead cranes, two of which have a joint hoisting capacity of 50 tonnes, ensure we can transport items around internally on the premises with no problems. They also allow us to guarantee short loading and unloading times. Coes also has carts for internal transportation, with a capacity of up to 80 tonnes per item, and also nine fork-lift trucks and our own trailers. So Coes Metaalbescherming is the best partner you could have to blast and conserve large, heavy constructions. Our blasting hall can take large constructions of up to 25 x 14 metres without any problem. Even individual large items, or series of them, can be blasted by our ultra-modern computer-controlled robot. Using this robot ensures consistency of blast quality and extremely high productivity. Robotic blasting is a unique technique; click here to see the robot in action. We can also undertake manual blasting, using two different blasting techniques, for metallic and inert items. Galvanised pieces are treated with particular care, being blasted under reduced pressure using an inert abradent to avoid damaging the protective layer of zinc. 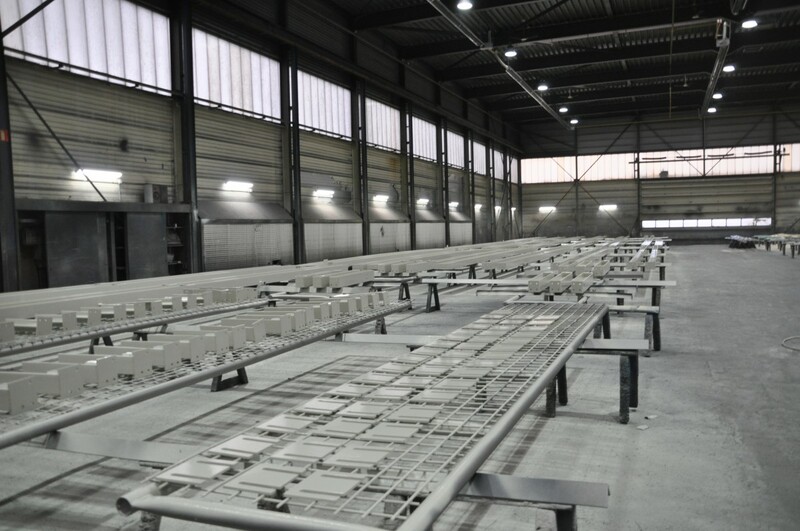 Steel beams, profiled sheet walls and the like will be blasted automatically in our blasting machine if they fit (the aperture dimensions are 2400 x 1000 mm). Coes Metaalbescherming is able to metallise zinc, zinc-aluminium or aluminium items. We have four state-of-the-art galvanisers available for the purpose. 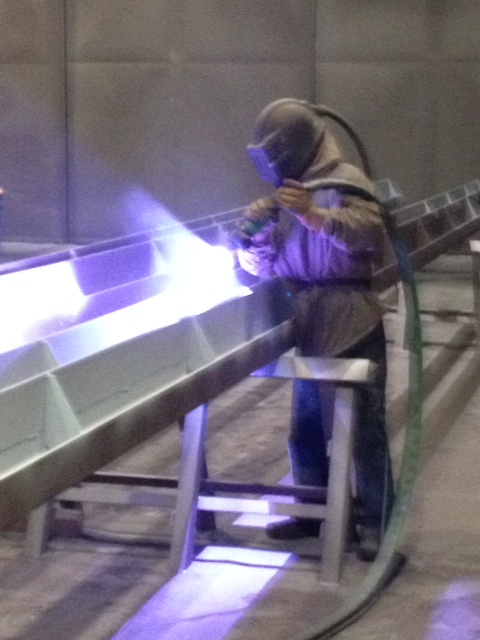 Metallisation is the thermal spraying of an aluminium or zinc alloy onto blasted steel. It is often used to protect steel constructions better and for longer by boosting their resistance to corrosion, making them more durable. This process involves zinc and zinc-aluminium wire being melted by application of heat and then sprayed onto the material. NEN EN ISO 12944-3 supplies the guidelines for the technical design of this procedure. Coes Metaalbescherming has several controlled-atmosphere spraying halls, set up optimally for conservation work. Our newest hall (with an area of 1,200m²) boasts a hyper-modern heating and ventilation system; our largest hall covers a surface area of nearly 3,000 m². With such capacity , we are well able to deliver on our deadlines and quality agreements. Coes Metaalbescherming has all the requisite knowledge to provide good advice on technical queries on paint, and has the equipment needed to deliver the product you have ordered on time and for a competitive price.